One of the best things I did at university, besides drinking heavily and fraternising with my fellow students, was the decision to study Astrophysics. Yes, for a small part of my life I could look at the heavens on a clear night and actually know which point of light was which. Notwithstanding the fact that such nights in a coastal town in eastern Scotland were cold enough to freeze the hairy spheres from a number of particularly whimsical brass monkeys, these were good times and the culmination of a youth spent watching a lot of Star Trek, wondering what it will be like if we, as a slightly more evolved collection of the aforementioned monkeys, were ever to get to the stars. The naive optimists amongst you may think that we’ll transcend war, poverty and generally being unpleasant to each other in favour of some kind of hippie Utopia where everyone is equal and all the bad things have gone from society. The more realistic (or cynical in my case) of you will probably think that, whilst all that flowery thinking is good in principle, it’s got about the same chance of happening as I have attracting Christina Hendricks to be the mother of my future children. That being the case, if we do manage to survive the next few years of Donald Trump, Brexit, the reduction of choice in the Sainsbury’s lunch deal range and finally get beyond the little blue space marble we call home, then Eclipse: New Dawn for the Galaxy is probably a fair representation of what things may be like. Whilst not the freshest game to be covered by our beady eyes here at Polyhedron Collider, Eclipse stands out for me as a very good example of a 4X game manifested in tabletop form. For those of you unfamiliar with the term, 4X stands for “eXplore, eXpand, eXploit and eXterminate” and that tells you pretty much what you need to know about the premise of Eclipse. If any of you have played Sins of a Solar Empire or Civilisation on the PC, you’ll have a fair idea of what’s involved. Start with a small patch of space, blindly stumble around trying to find stuff, start a fight or two then crush your enemies with superior firepower. Or play nice and see how far that gets you. Eclipse is not what you’d call a lightweight game. In fact it’s probably fairer to say it’s heavier than a Blue Whale that’s discovered how to get Dominos to deliver plankton pizza. It’s got quite literally thousands of counters and playing pieces and as a result, is a bit of a mission to set up. Eclipse currently has three major expansions, but I’m concentrating on the base game in this review. Some of the photos include items from Ship Pack One, which is basically a miniatures pack for the base alien species. There’s a bunch of human factions together with a wide variety of alien species each possessing their own talents. These abilities can affect the way each species conducts research, explores, upgrades and so on, so there’s a lot to experiment with right there. Eclipse plays up to 6 people, which is expanded to a whopping 9 with Rise of the Ancients. 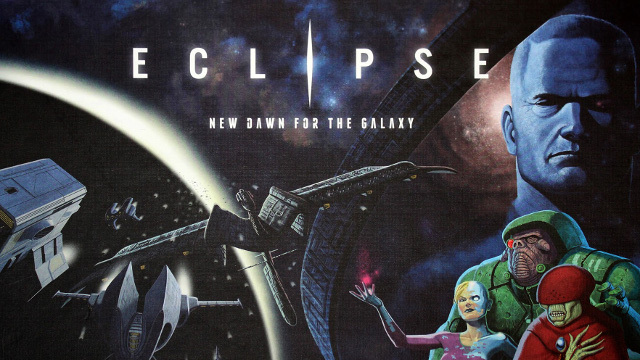 Despite the size and heft of the game, Eclipse is actually remarkably streamlined to play. The hex-tiled map is unknown from the outset beyond each player’s patch of space and the Galactic Core. There’s three concentric “rings” that form the galaxy, with the players start positions in the second ring out allowing them to explore towards the core where there are more resources and more chance of Ancient Aliens, or outwards to relative safety, but fewer resources. Ultimately, the aim of the game is to acquire Victory Points which can be achieved in a few ways, allowing a huge number of possible approaches to the game; another aspect I really love. VPs are awarded either through combat, research, territory control or exploration. You’ll probably find a mixture of all four is required, but finding the sweet spot is the key and depending on what your opponents do, you may find your strategy changes midway through. The underlying resources of the game are Money, Science and Materials – the latter two support research and ship building respectively. Resources are acquired by the placement of population cubes onto planets – three types for the three resources – so you need to expand to support your empires demands and generate more resource so you can expand further. A nice, self-regulating runaway process. Players have a limited number of influence discs that represent the actions that they wish to take, not unlike a worker placement mechanic. Actions that can be taken are Explore (uncover new hexes), Research (buy available technology), Move (navigate units around the map), Upgrade (add/remove tech to/from ships), Influence (shift control of hexes) or Build (construct ships). Using discs costs money; your empire will generate a limited amount of money each turn so there’s a balance to be made between what you generate and what you spend, thus providing a natural limit to the number of actions a player can make in a turn. You’re free to take as many actions as you have disks, but run out of money at the end of the turn and your empire will collapse faster than a Middle Eastern peace negotiation. On top of that, you need a disk to represent control of a hex, so the bigger your empire, the more it costs you to run it. I love this mechanic as it imposes a natural size and scope to player domains. Some tech adds more disks which gives you more actions and adds something for the fans of efficient bureaucracy amongst you. There are a lot of technologies in the game, but you can’t use them until you’ve invested in the necessary research. Research is quite a straightforward process – spend your science budget on a tech you want and add it to your board. Do enough research and you’ll start to earn VPs. There isn’t a tech tree as such, but more powerful tech costs more Science so you’ll have to save up a while for the really meaty stuff, unless your empire is comprised of some kind of enterprising nerd population and produces more Science than the Large Hadron Collider on amphetamines. An occasional issue here is the tech available is randomly drawn at the start of each turn – it adds a nice level of competition, but it can mean that some tech may not be available until later in the game when it may be less beneficial or only one instance comes out, bought by a single player which then makes them far too powerful. Speaking of power, combat is inevitable and dice-based. To put it succinctly, roll dice for each weapon (ships can have more than one) involved in that round of combat, add or subtract modifiers, choose your targets then remove them from the hex if you’ve battered them enough. Different weapons do different levels of damage, can use multiple dice and bigger guns mean more damage so it’s in your interest to upgrade your ships. There’s a lot of dice bundled with the game and they’re conveniently coloured, which makes tracking which weapon does what much easier, but rather bizarrely I found there still weren’t enough. Perhaps that’s a reflection of my aggressive and warlike nature, but it’s a bit of an inconvenience in multiple-combatant scenarios. I’ve heard comments suggesting that the combat is a bit too random, which being dice based is bound to be the case, but I quite like the idea and I think it’s a reflection of chaotic space combat. After all, Luke Skywalker took down the Death Star in a Reliant Robin with wings so anything is possible. The only drag on the combat is sometimes the sheer number of ships that are involved is too many for the particular hex especially with Ship Pack One’s larger models – although Eclipse does alleviate that by including some “crowded hex tiles” to provide more space. Don’t expect to have a quick blast through the game – the box says 30 mins per player, for seasoned players that may be the case, but double it and you’re getting close for most folk. There’s also the setup and pack up time, which isn’t insignificant, so for a 4 player game, you’re looking at about 5 hours. The game will start pretty fast but you’ll find that, despite Douglas Adams insisting that space is very big, it’ll run out very quickly in Eclipse especially with 6 players. It all gets a bit cosy and fisticuffs are just a hex away. In case it’s not obvious, I like Eclipse; I like it a lot. It (and its plethora of expansions) takes pride of place in my gaming cupboard because I just love the way it feels, looks and plays. It’s a very well thought out game despite a slight imbalance in a couple of the combat technologies – one’s too cheap and another is too powerful. Plus for what you get in the box for the money, like the average Jeremy Kyle viewer, it’s a no-brainer. So it turns out if Eclipse’s vision of the future is correct, there’s room for both philosophies – you can sit in your corner of the galaxy, reading books, braiding hair and subsisting on organic, free range quinoa or you can expand rapidly, consume every natural resource you lay your hands on and subdue anything that stands in the way. Strike a balance and you may be onto a winner. Assuming you can stand the concept of “The Granola Wars”.